Game of Thrones has provided us with some outstanding episodes this season, which left us with high hopes for the Season 5 finale “Mother’s Mercy.” We were not disappointed as “Mother’s Mercy” gave us some resolution, tenderness, shock, and a lot of suspense for what’s to come in Season 6 of Game of Thrones. “Mother’s Mercy” continues with themes of vengeance, righteousness, and human connection we have seen throughout Season 5. Now that the season has ended, get your GoT fix by checking out our list of the 10 Best Game of Thrones Inspired Videos. The Lord of Light is melting the snows away to aid in Stannis Baratheon’s attack on Winterfell, or so Melisandre would lead him to believe. Yet, half of Stannis’s army deserted before dawn. Few want to fight for a monster who murders his own daughter out of selfish ambition. Desertion was not the only event that took place during the night, as Stannis’s wife Selyse has died, apparently hanging herself from a tree. No mercy here. Though she had a moment of motherly compassion when she saw her daughter Shireen burning, after a lifetime of disdain and derision it was far too late. 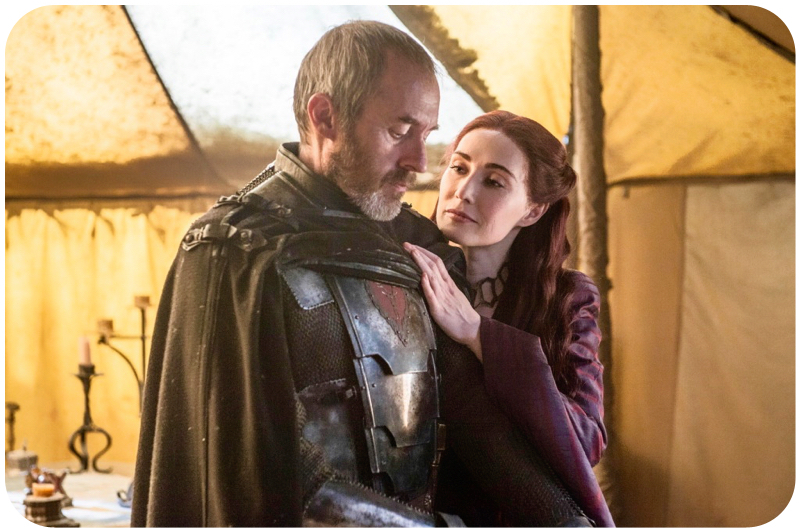 The scene leaves us cold because it’s hard to have any empathy for either Selyse or Stannis, yet we aren’t given the satisfaction often felt when a villainous character meets a terrible and well-deserved fate. It all feels so wasted and pointless, and we feel a bit betrayed for having become invested in Stannis Baratheon during Season 5. 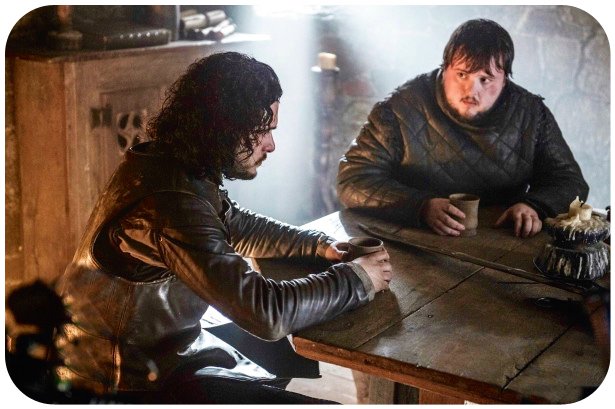 Jon Snow and Sam Tarly discuss the events at Hardhome. Jon seems hopeless, pointing out that with tens of thousands of dead men, the White Walkers have the biggest army in the world. He just hopes they don’t learn to climb the Wall. Sam asks how many Valyrian steel swords are left in the world, and Jon replies, “Not enough.” Lord Commander Jon Snow is now the most hated man at Castle Black since he sacrificed men of the Night’s Watch to save wildlings. Sam realizes that they need help to defeat the White Walkers and suggests the library at the Citadel. Sam is also motivated because he knows that Gilly and the baby will die if they stay at Castle Black. He tells Jon that he will die trying to protect Gilly, and he can’t bear the idea that the look in her eyes when he fails her will be the last thing he sees. 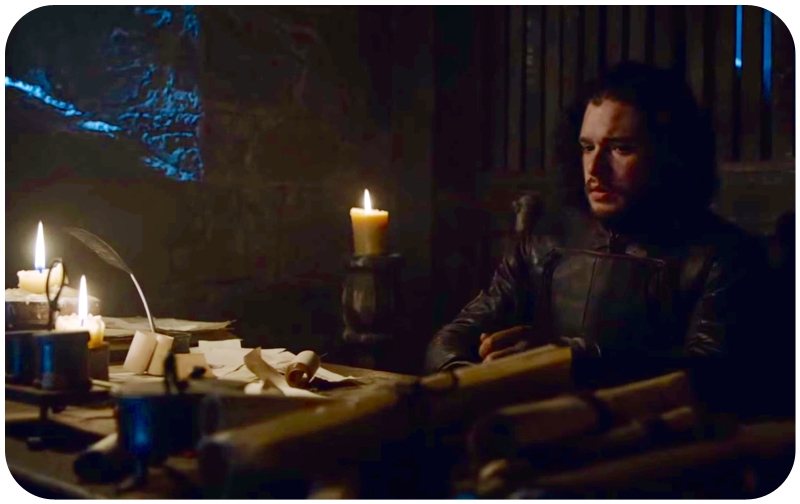 Jon agrees to Sam’s request to take them to Oldtown where Sam can study at the Citadel to become a Maester. Jon realizes that there is something different about Sam, noting, “I’m glad the end of the world’s working out for someone.” Us too. What’s left of Stannis’s army advances on Winterfell, without Lady Melisandre, who has abandoned Stannis. Within the walls of Winterfell, Sansa Stark uses the corkscrew she found earlier, not to kill Ramsey, but to escape her imprisonment. Sansa leaves and makes her way to the broken tower. Outside of Winterfell, Podrick Payne has seen Stannis’s army approaching Winterfell. Brienne’s desire for vengeance overcomes her duty to protect Sansa, and she leaves her post just before Sansa lights a candle in the tower. The Boltons and their much bigger army have come out on the field to meet Stannis, and it’s a slaughter. Stannis survives long enough for Brienne to get her revenge. It seems terribly hollow. 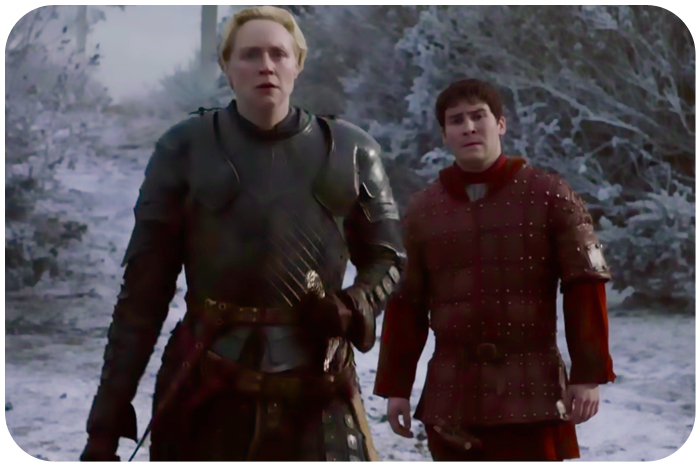 While Brienne kills Stannis, Ramsey Snow is getting a morbid enjoyment from finishing off any of Stannis’s army he can find anywhere close to still being alive. His sleeves must be drenched with blood after cleaning his sword so many times. 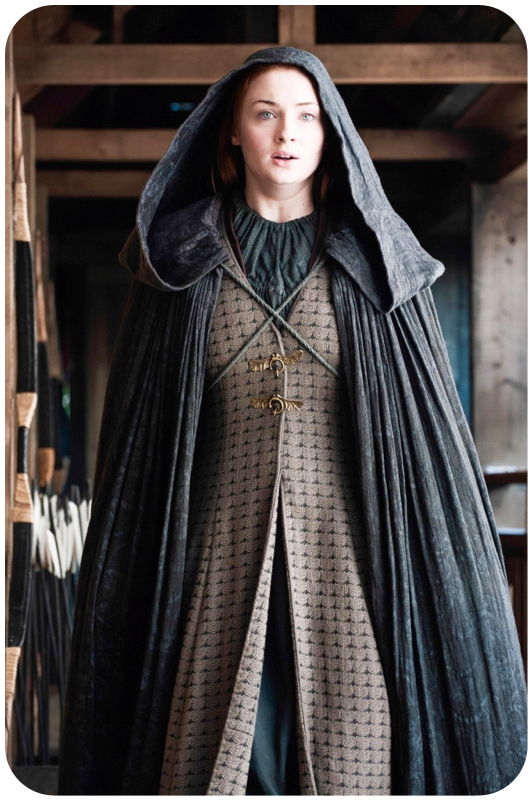 While waiting in the broken tower, Sansa sees that Stannis’s army is vastly outnumbered by the Bolton’s, and she realizes no one is coming to save her. Myranda and Theon approach Sansa as she walks along the walls of Winterfell. Theon stops Myranda from attacking Sansa, pushing Myranda off the wall to her death.. We would give out a little cheer, but we’re trying not to rejoice too much in death, even fictional death, so we don’t seem like Ramsey. The Bolton forces return to the castle, which panics both Sansa and Theon. Theon takes Sansa’s hand and runs to the edge of the castle wall, and they both jump. Here’s to hoping someone has placed a bouncy castle for the Winterfell children at the bottom of the castle wall. Meryn Trant is torturing little girls. One of the little girls has her face hidden, and we wonder if it’s Arya Stark. She looks up and it isn’t her, but it turns out it really is. Arya is wearing one of the faces of the Faceless Men. Cool. Arya stabs Meryn in his eyes and chest and then tells him, “Do you know who I am? I’m Arya Stark. Do you know who you are? You’re no one. You’re nothing,” before finally cutting his throat. Back in The House of Black and White, Arya tries to return the borrowed face without anyone knowing. 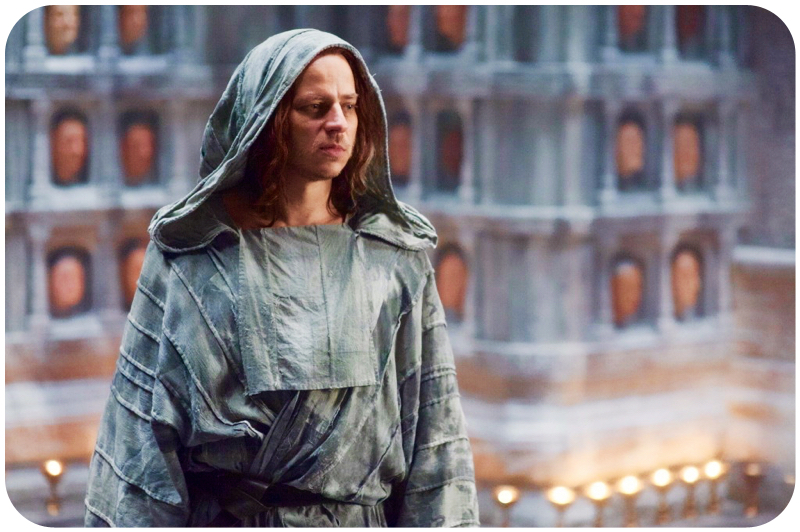 But of course everyone knows, and by everyone we mean Jaqen H’ghar and the servant girl. Jaqen H’ghar tells Arya, “A girl has taken a life. The wrong life.” As the girl restrains Arya, Jaqen H’ghar holds up a bottle and tells her that only death can pay for life. Rather than giving what’s in the bottle to Arya, he drinks the poison and collapses on the floor as Arya cries out for him. Yet the man she thought was Jaqen H’ghar still stands alive behind her. She pulls off the various faces of the dead figure on the floor until she finds her own face there. Jaqen H’ghar tells her that the faces in the House of Black and White are for no one, but she is still someone, and “to someone the faces are as good as poison.” Arya’s vision begins to fade and she cries out that she can’t see. Jaime Lannister and Bronn stand at a Dorne dock, along with Prince Trystane and Myrcella Baratheon, waiting to depart for King’s Landing. For some reason, Ellaria Sand and the three Sand Snakes are there, along with Prince Doran Martell, to see them off. Do those who have just tried to kill you always give you a sendoff in Dorne? Ellaria gives Myrcella a long kiss goodbye. Yeah, that seemed weird, but who understands Dornish cultural practices? 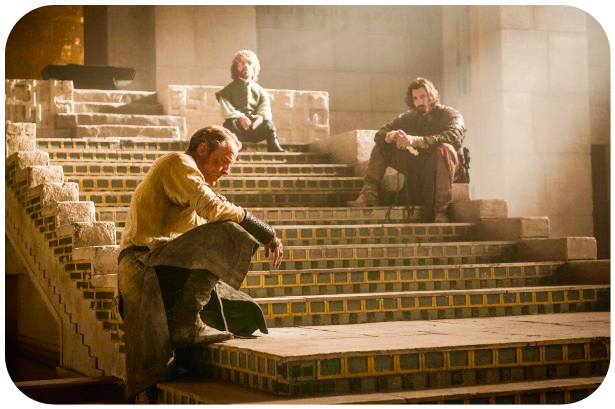 Bronn has his own farewell with Tyene Sand. Once they are on the ship, Jaime gives Myrcella back her necklace. Jaime starts out the most awkward of father-daughter talks ever with, “We don’t choose who we love; it’s beyond our control.” Myrcella already knows what’s up and tells Jaime that she’s glad he’s her father and they hug. In this touching moment, the entire Game of Thrones audience realizes that Myrcella’s bound to die. As their embrace ends, Myrcella’s nose starts to bleed and she collapses. Back on the dock, Ellaria wipes the remaining poison from her lips, takes the antidote from around her neck and drinks it as she and the Sand Snakes walk off the pier. So that was why Ellaria gave her the long kiss. Jorah and Daario plan to go and find Daenerys, and Tyrion seems to think he should go as well. Daario points out that Tyrion’s only real skill is talking, which would be of little use on such an expedition. It is decided, mostly by Daario, that Tyrion must stay to govern Meereen, with support from Grey Worm and Missandei. As Tyrion watches Daario and Jorah leave to search for the Queen, Varys arrives just in time to help Tyrion manage a city on the brink of civil war. 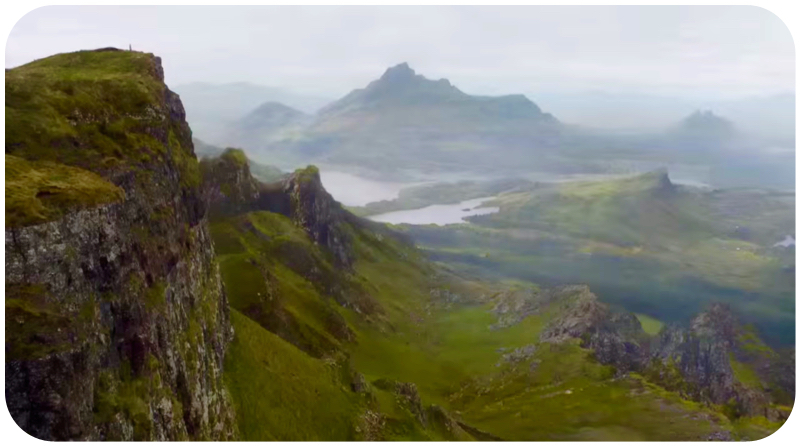 Daenerys is with Drogon, atop a far-off ridge. He is being as stubborn as a cat and only wants to rest and recover amongst the bones of his long dead quarry. When she looks for food, she is approached by a horde of Dothraki. She drops her ring to the ground as a breadcrumb for those who might come and look for her, and the Dothraki begin to circle her. Cersei confesses her sin to the High Sparrow—at least her sin with cousin Lancel Lannister, though she denies that her children are Jaime’s. 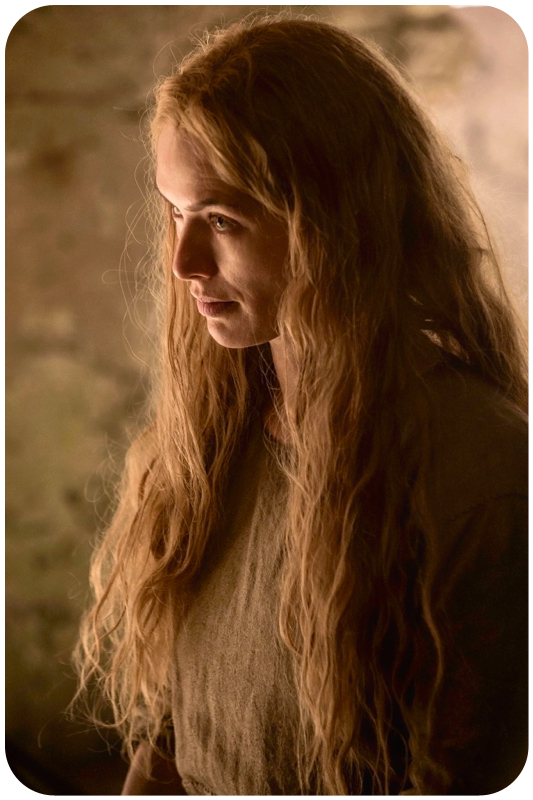 She asks for the Mother’s mercy, and the High Sparrow tells her that he will allow her to return to the Red Keep “after her atonement.” Cersei’s hair is cut short and she is forced to endure a walk of shame in which she walks through the streets of King’s Landing “naked before the eyes of God and Man.” As she walks through the streets she is chastised by the crowds of people there to watch her exhibition of atonement. She collapses at one point, but when she looks up and sees the Red Keep, it gives her the strength to keep going. When Cersei enters the Red Keep, Qyburn is there waiting with something to cover her bruised and bloodied body, along with what seems to be a reanimated version of the Mountain. Qyburn knows what Cersei needs. He introduces the large figure as a new member of the King’s Guard, telling her, “If it please your Grace, he’s taken a holy vow of silence. He’s sworn that he will not speak until all his Grace’s enemies are dead and evil has been driven from the realm.” As the large figure carries her off to have Qyburn treat her wounds, Cersei wears a look of peace. Davos and Jon Snow are arguing about sending men to help Stannis when Melisandre arrives. It becomes clear that all has been lost. 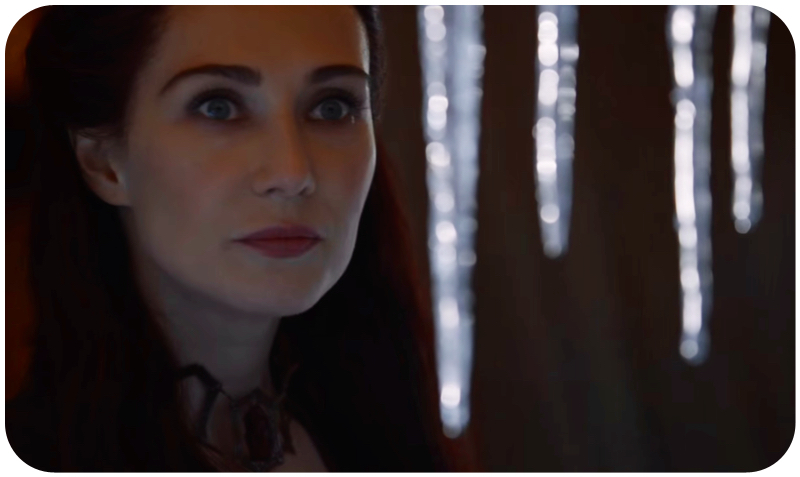 Davos asks about Shireen, but Melisandre just looks at him and says nothing. Ollie comes into Jon Snow’s office telling him that a wildling claims his Uncle Benjen is still alive. Jon rushes after Ollie, who leads him to Alliser Thorne and a group of men in the courtyard of Castle Black. Jon sees a sign that says “traitor” and realizes something’s up. Alliser is the first to stab Jon in the stomach, saying “For the Watch.” Four other men follow, with Ollie being the last to stab Jon before he collapses in the snow. Et tu, Ollie? Stannis Baratheon and Jon Snow are on a parallel path in “Mother’s Mercy.” Both Stannis and Jon have acted in ways that leave their men feeling betrayed. While Stannis made his terrible choice in order to become a king and “fulfill his destiny,” Jon tried to rescue the wildlings in an attempt to save all of Westeros from the White Walkers. Though Stannis ultimately played the role of a villain, while Jon acted heroically (in the eyes of some), they both felt what they were doing was right—just as those who killed them felt that they were in the right. The efforts of both of these men caused dissent that could not be overcome, and neither achieved his goals. Their efforts were in vain, and ultimately both these men faced vengeance at the end of a blade. Just as we learn that heroes never win, “Mother’s Mercy” shows us that vengeance isn’t all that it’s cracked up to be, either. Brienne gets so distracted by the possibility of avenging Renly that she abandons her watch on Winterfell just as the opportunity to help Sansa presents itself. It seems likely that Brienne could have rescued Sansa with all the Bolton soldiers distracted by battle. When she approaches, Stannis doesn’t make excuses and ask for his life to be spared, but instead tells Brienne to do her duty. Stannis acts honorably at the end, and Brienne kills a dying man in a forest filled with dead soldiers. Brienne gave up her promise to help the living to ensure a man long dead was avenged. Arya Stark finds that her vengeance against Meryn Trant comes with unanticipated consequences. When you claim to serve the Many-Faced God, you risk facing his wrath when you use death to satisfy your own desires. Though killing Meryn Trant seemed to have the significance Arya had hoped for (the audience was pretty glad to see him go, too), she had given up the right to take lives for herself when she joined the House of Black and White. 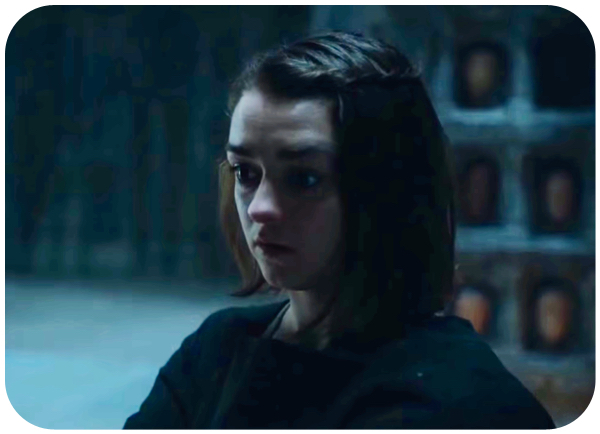 As a result of using one of the faces in her mission, Arya is left without sight. We don’t know if Ellaria Sand’s revenge against the Lannisters will ultimately give her the satisfaction she’s looking for. It sure seemed to leave her feeling smug and self-satisfied, but we suspect her life will be forfeit if Prince Doran Martell finds out. Then again, we can’t conceive of why Prince Doran had the ladies at the dock in the first place. Did she manage to pull one over on Prince Doran, or was he involved in some way? It seems unlikely that Doran would’ve wanted this to happen, as his son is now potentially a captive of the Lannisters. We’ll find out in Season 6, though honestly, we don’t really care that much about what happens in Dorne. While we know that many of the book’s readers have been waiting for the moment of Cersei’s Walk of Shame, the scene takes way too long. Two or three minutes of her walking down the street would have been sufficient. Though Cersei certainly got her comeuppance, it was mitigated by Qyburn’s mountainous news. With Theon finally helping Sansa, right off a wall, we’re not sure that this was the redemption story we were hoping for. Though we never actually believed Theon was redeemable, we were all for him helping Sansa, who remains one of our favorite characters despite her dreadful storyline of late. The redeemed character that we did feel for in “Mother’s Mercy” was Jaime Lannister. The moment of fatherhood was very short-lived. Of course, the fact that Bronn is familiar with the poison tactic and that Prince Doran would naturally be suspicious of Ellaria means that Myrcella could still be saved. But we doubt it. We loved Daario Naharis as he directed events in Meereen. It wasn’t clear if he genuinely cared for Daenerys until these last two episodes. With all the chaos in Meereen, it felt good to know that this core group at least had a plan. Perhaps with Tyrion ruling, Meereen will give us a better narrative in the future. We hope so, anyway. And what of the dragons Rhaeghal and Viserion? Let’s hope between Tyrion governing with the help of the dream team, the budding romance between Grey Worm and Missandei, and the dragons, that Season 6 will bring us a good story in Meereen. We loved seeing Drogon act all grumpy in his nest of bones. Who does Daenerys Targaryen think she is, anyway? It was a beautiful location with a fantastic-looking dragon. Then a horde of Dothraki arrived! We really couldn’t have asked for more. Up at Castle Black it wasn’t surprising to see Ollie stab Jon Snow, as we had been getting clues Ollie might take action against Jon ever since Jon partnered with Tormund Giantsbane. We had held out hope, though that despite playing the role of Jon’s nemesis, Alliser Thorne would have too much honor to be involved in a mutiny. The Game of Thrones writers did a good job of developing the story enough to make us believe that Jon could be assassinated without actually giving it away. We are looking at a potentially large body count of characters in this season finale: Stannis Baratheon, Myrcella Baratheon, Jon Snow, Myranda, Sansa Stark, Theon Greyjoy. The scene between Stephen Dillane (Stannis Baratheon) and Gwendoline Christie (Brienne of Tarth) showed what impressive actors they are. When Stannis’s face showed flickers of doubt, you could see his resolve return in his eyes. Brienne’s surprise at Stannis’s response and her own hesitation played on her face, along with her own resolution. 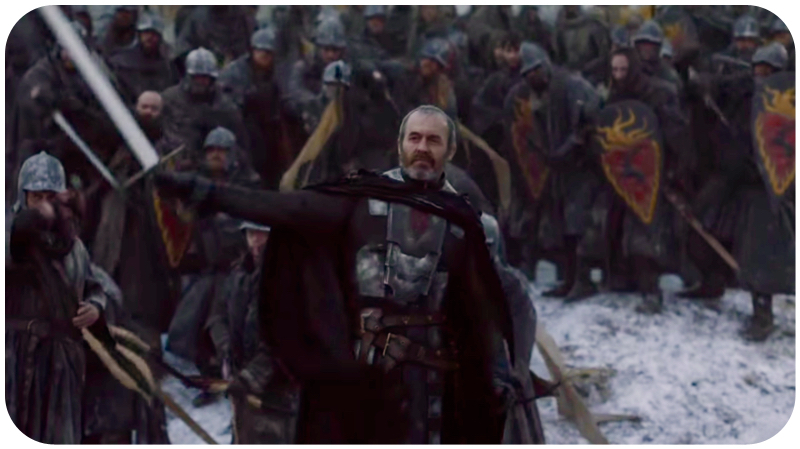 Stephen Dillane has been an outstanding actor in the series and he will be missed. With Jon Snow being stabbed to death, it’s not clear if Kit Harington will continue to have a role in Game of Thrones. We also won’t know the fate of Sansa Stark (Sophie Turner) and Theon Greyjoy (Alfie Allen) until Season 6. Season 5 of Game of Thrones was a very strong season with moments both exciting and terrible. “Mother’s Mercy” provided some resolution while still giving us a lot of surprises. Game of Thrones continues to shock and awe us, and we look forward to what it will bring us in Season 6.
an McShane joining the cast has gotten me even more pumped up for the next season. Absolutely amazing actor. Agreed. He will make a great addition to an already terrific cast.